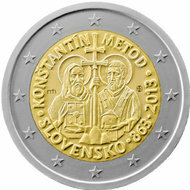 The European Commission at first ordered Slovakia to revise its monks-in-halos design for a commemorative euro coin. BRATISLAVA, Slovakia — Stanislav Zvolensky, the Roman Catholic archbishop of the Slovak capital here, was thrilled when he was invited to Brussels three years ago to discuss the fight against poverty with the insistently secular bureaucracy of the European Union. “They let me in wearing my cross,” the archbishop recalled. It therefore came as a rude surprise when, late last year, the National Bank of Slovakia announced that the European Commission, the union’s executive arm, had ordered it to remove halos and crosses from special commemorative euro coins due to be minted this summer. The coins, designed by a local artist, were intended to celebrate the 1,150th anniversary of Christianity’s arrival in Slovak lands but have instead become tokens of the faith’s retreat from contemporary Europe. They featured two evangelizing Byzantine monks, Cyril and Methodius, their heads crowned by halos and one’s robe decorated with crosses, which fell foul of European diversity rules that ban any tilt toward a single faith. In a continent divided by many languages, vast differences of culture and economic gaps, the archbishop said that centuries of Christianity provide a rare element shared by all of the soon-to-be 28 members of the fractious union. Croatia, a mostly Catholic nation like Slovakia, joins next month. Yet at a time when Europe needs solidarity and a unified sense of purpose to grapple with its seemingly endless economic crisis, religion has instead become yet another a source of discord. It divides mostly secular Western Europe from profoundly religious nations in the east like Poland and those in between both in geography and in faith like Slovakia. Europe is suffused with Christianity, or at least memories of its past influence. The landscape is dotted with churches, now mostly empty, and monasteries, its ancient universities are rooted in medieval religious scholarship, and many of its national crests and anthems pay homage to God. Even the European Union’s flag — a circle of 12 yellow stars on a blue background — has a coded Christian message. Arsène Heitz, a French Catholic who designed the flag in 1955, drew inspiration from Christian iconography of the Virgin Mary wearing a crown with 12 stars. The same 12 stars appear on all euro coins. The very idea that Europe should unite began with efforts to rally Christendom in the ninth century by Charlemagne, the first ruler of the Holy Roman Empire. “There is a general suspicion of anything religious, a view that faith should be kept out of the public sphere,” said Gudrun Kugler, director of the Observatory on Intolerance and Discrimination against Christians, a Vienna-based research and lobbying group. “There is a very strong current of radical secularism,” she said, adding that this affects all religions but is particularly strong against Christianity because of a view that “Christianity dominated unfairly for centuries” and needs to be put in its place. Obliged by treaty to consult with religious and secular groups, the European Commission, said Ms. von Schnurbein, attaches “great importance” to this dialogue, which she described as “unique” for an international body. The commission’s monetary and economic affairs department that ordered Slovakia to redesign its commemorative euro coins says it had no real problem itself with halos and crosses and demanded that they be deleted in the interest of “religious diversity” because of complaints from countries that also use the euro. Leading the charge was France, which enforces a rigid division of church and state at home, and objected to Christian symbols appearing on Slovak money that would also be legal tender in France. Greece, where church and state are closely intertwined, also protested, apparently because it considers the Greek-born monks Cyril and Methodius as part of its own heritage. For the European Union’s most strident critics, the dispute has been a godsend, buttressing their argument that Brussels is an alien, meddling and sinister force. “I need to voice a serious and disturbing suspicion: that the E.U. is under the control of Satan or Satanism,” said Rafael Rafaj of the Slovak National Party, a far-right nationalist party. The view that the European Union serves Satan has become a popular theme for some extreme Christian fundamentalists, who cite the Bible’s Book of Revelation as proof that dissolving national boundaries signals an approaching apocalypse. This is partly due to the rise of well-organized secular groups that pounce on any hint that Christians are being favored over other religions or nonbelievers. But a bigger reason, said Mr. Leustean, is a shift in demography and public attitudes. Church attendance is falling across Europe as belief in God wanes and even cultural attachments wither. The Continent’s fastest-growing faith is now Islam. In Britain, according to a poll last year, more people believe in extraterrestrials than in God. In the European Union as a whole, according to a 2010 survey, around half the population believes in God, compared with over 90 percent in the United States. The collapse of communism in Eastern Europe slowed the secular tide somewhat as the European Union began to admit new and sometimes deeply religious countries like Poland and Romania. Jacques Delors, the president of the European Commission in the 1990s, kicked off a debate on the “soul of Europe” and held informal meetings with church and other religious leaders. It mandated dialogue with religious groups. But it also ordered equal treatment for “philosophical and non-confessional organizations,” which include groups whose principal philosophy is hostility to organized religion. Archbishop Zvolensky of Bratislava predicted that efforts at European unity are doomed unless the union gives a bigger place to God. “Religion should be the inner strength of the union,” he said. He does see one encouraging sign: Slovakia’s national bank has decided to stick with its original coin design and abandon plans for a halo-free minting in honor of Cyril and Methodius. The European Commission has gone along with this, and the commemorative coins will finally be minted next month — two months later than originally planned — but with halos and crosses.